Thread: UFO driving me crazy!!! I have committed to at least making all the blocks for a UFO that I have had for years. I have cut out tons of 1" strips, and am half way through making 80 tiny log cabin type blocks, and they are getting on my nerves. I didn't realize just how small 1" really is. All the pieces of thread from cut edges and the mindless sewing!!! UGH!!!! ARG!!!!! Here is a pic of the quilt - at one time when I first started this the angel applique spoke to me - and now, I need some encouragement. Am I losing it? There are other projects that I have lost the desire to do too!!! I have a block of the month (from a pile of 12 another UFO) done through April, have the Craftsy BOM done through April, and have no desire to do more on these too!!! What do you'all do when the crazies hit??? I'm the type of quilter who would probably quit with these blocks and use them in something else. I quilt for the fun of it (and the love of creation and fabric). Years ago I started some blocks to make matching twin size quilts for my son's bed. I needed 56 blocks for each quilt. Each block was taking me more than an hour to complete. After about 25 blocks, I was sick of the fabric and the design. I also decided that an hour per block was too much time. So I came up with a new plan and ended up using those blocks as accents on the final design. your problem is not at all unusual. that's why so many quilters have so many UFOs in their collections. maybe you're just putting too much pressure on yourself. when quilting starts to feel like work ... the fun goes out the window. just a suggestion ... try doing a bit on one of them; then a bit on another; and so on. rotate your time between the UFOs instead of trying to pick one to slog through to the end. make sure you get the instructions for each month of those BsOM as soon as they're available. that way you'll have them when you are in the mood to work on them. I love those little log cabin blocks. Just did a bunch for a Country Threads pattern where they were 4 inches and alternated with little pieced houses. I am going to make a second one for me since the first one is for my mother in law. I just finished a log cabin quilt I started in 2006 and I understand completely about the undergoing they are. I so wanted to give up. I did like patrice said, just sat them there and worked on a couple rounds at a time. It took me just a couple months to get them done once I started the discipline to do a little at a time. This way I did not get totally bonkers over them. Keep at it girl, you will get there. It is good advice from Patrice. If the project no longer "speaks" to you and is driving you crazy, then I would give it away! There may be someone in your local guild who would be delighted to finish this. If donating it is not an option, try turning the parts you have done it into something (bag, purse, tiny wall hanging) and use any left over fabric in another project. Sometimes in spite of our best intentions, a project just doesn't get finished. Every quilter has a few of those. I have just recently finished the blocks for a quilt top that were cut out when I was 16. I was going to tip all of those unstitched bits into the trash when I realized that they were a direct link to home and were pieces of my childhood. I've framed each block and will make two quilts, one for my sister and one for me! I am going to put this aside for awhile, it has become an obsession - not enjoyment by any means. I have become like a pieceworker in a factory (remember the little guy on the Dunkin Donuts commercial "gotta make the donuts?"). So into a clear baggie, and into the UFO tub it goes for now. I need a break - and needed you guys to tell me that. Thank you!!! i have a spiderweb project that isn't ever going to get finished. sometimes you let it drift and maybe it becomes something else. sometimes i wonder if a ufo exchange wouldn't be a great idea. get a bunch of quilters together and trade our abandoned projects! but working away at something like that over the course of an unlimited amount of time makes sense to me too. eventually even the snail gets to the other side of the garden, right? Sometimes I like to do a little mindless sewing. Work on something small and new that interests you. Keep your Log Cabin blocks and strips out and do 1 block when you feel like it. I have a Spiderweb scrap quilt that I do that with. I really enjoy just doing a couple of triangle blocks when I am between projects. I have 6 projects going on concurrently. My goal is to FINISH them all and none of them really blow my skirt up. So there they sit and as I get bored out of my skull with one, I move to the next one that (at least temporarily) seems less tedious. With all of the blocks done so far, can you cut the size of the project down? Instead of finishing it to the size given, make it smaller. That way you can enjoy the patter and you'll be done faster. Sometimes the wonderful quilt that you just had to make next turns out not to be so wonderful. I have started quilts that looked so nice on the picture, but turned out not so nice about 1/2 way through. Some are gone and some are hanging in the closet with all the other UFO's. I will get to them "someday", I hope. That is my goal for the summer, in case some of you haven't already read about my goal. I'm not doing too good so far. I decided to tidy up my stash first. Do you think I'm putting things off? Here's to break time! Right on. You'll eventually get back to it and decide to finish it, pass it on or let it sit some more. You learn something new everytime you work on anything at all so keep building those quilting skills and have fun doing it. I have 2 applique boms that I have started. I'm determined to do them this summer! Its hard to get motivated once a project has set for a while. Sometimes a UFO just needs to "set" awhile and go on to another completely different project. Other times it pays to just keep on keeping on a bit at a time, perhaps returning to it between doing things that currently seem like more fun. I usually have several projects in various stages of completion that I sort of rotate in between ones that are urgently in need of completion by a specific time. In most cases, it isn't the end of the world if the UFO remains a UFO. Unless, of course, an unfinished project drives you bonkers. I have found it just gives me pleasure sitting at the sewing machine stitching. It doesn't matter if its a long term UFO. It's the process that I enjoy. The end result is just an added benefit. I just got a treadle and sewing with that is even more fun. Here's hoping you can rediscover the joy of your project. The little angels look so sweet! several projects going on at the same time. I have to agree with the Madquilter- I tried to work on just one and got bored. I have about 7/8 quilt tops going on at the same time. I sew on one then the other, and so on till that till it's time to do pressing and selecting the next piece. I keep the instructions with each group. Ahhhh.....those UFOs. I have one hovering over me and may take it on this fall. I like the advice to make it a smaller project and then move on to something else. I am not one to abandon something I start, but I have been known to modify the outcome. Good luck! I so feel your pain. I made a very complicated quilt that used 1" log cabin strips and swore never again, then of course made the quilt again and swore NEVER AGAIN! 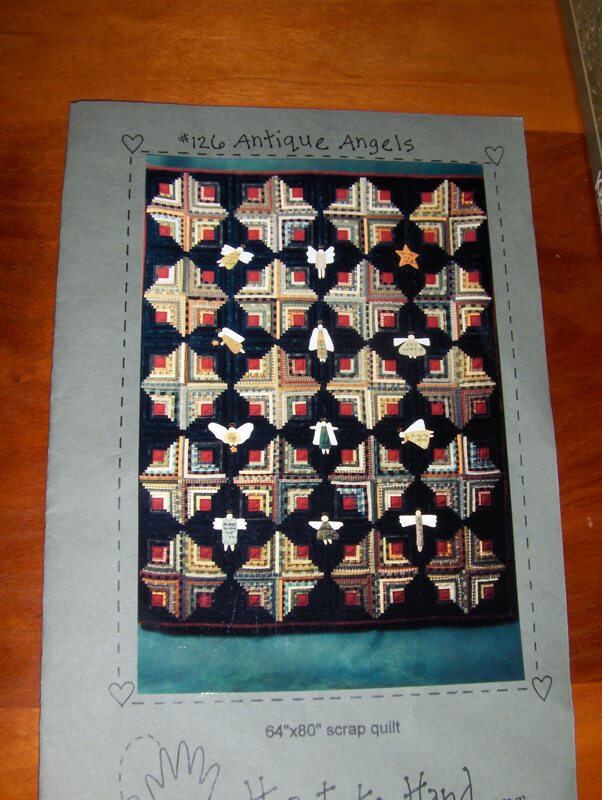 I love the angel quilt. My humble suggestion: finish the blocks four at a time, not try to do each log on every block. Once four are done, you can assemble them and add an angel. Put it on your design wall to smile at you while you work on the next four. It breaks up the project and the monotony, and you will see progress! When I finish a project, I usually dig out a UFO and put it on the empty design wall and look at it for a few days, see if it calls to me yet. Most of them do, and I remember why I started it. This board does not help, as I keep seeing gorgeous quilts and getting new ideas!